Las Vegas is scoring major returns on investments in its EDM music scene. The city has been blaring the sounds of its resident DJs across the country, and a new wave of Millennials are visiting to hear them live. And they’re arriving just in time, as Vegas struggles to recover from its recession-era lows, and much of the country turns to gambling to bring in new revenue. EDM fans are listening to Calvin Harris, Phantogram and Krewella on music streaming sites like Pandora and finding it hard to resist the temptation to see the acts in person. Advertisements and Vegas-branded stations have sprung up across these platforms to highlight Sin City’s latest addiction. Groups like the Las Vegas Convention and Visitors Authority, an industry collective tasked with boosting revenue across the city, may be planting these seeds of desire, but Millennials are certainly going wild for it. Research from Pandora alone shows EDM fans exposed to the site’s Vegas branding took more than 115,000 trips to the city, boosting revenue by $110 million. The company cross referenced those who were listening to EDM with those using the location-based Placed app and found the substantial increase in trips to Vegas among dance music fans. The synthesis of Vegas and EDM certainly makes sense. Besides the warm weather and abundant dance hall space, the two share a patented sense of abandon that only seems magnified when added together. ‘What happens in Vegas stays in Vegas’ could also be said for the dance floor of any massive, free-for-all EDM festival, so we can hardly imagine the debauchery of Vegas’ 230,000-strong Electric Daisy Carnival. The annual event now adds up at least $500 million in revenue to the city, a testament to EDM’s new centrality in the city. Vegas has to be betting on more than just gambling for its future, and putting on a show like you can see nowhere else in the world is a good start. 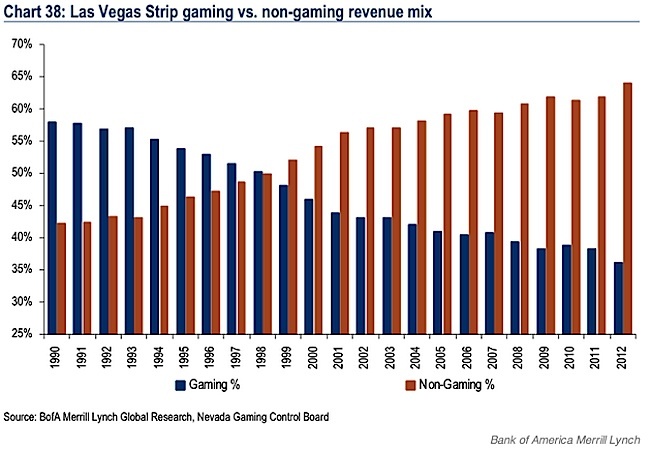 In the past 15 years, non-gaming revenues have dominated gaming as the major source of revenue on the strip, demonstrating the power of shows and music to best even gambling for a good time. And the shift is most pronounced among Millennials, who have proven they are willing to spend big if the experience warrants it. So, Las Vegas may not be bringing Millennials to the profit-minting casinos that have made the city famous. But its teaming dance floors and in-house DJs may prove a worthy replacement. After all, what’s more of a gamble than head bopping Vegas style?